Nothing epitomizes the challenges confronting a documentary at Cannes more than the contrast of festival screenings with the live-action distractions of the Croissette, the famed beachside promenade. Just around the corner from the theater where Argentinean director Rodrigo Vazquez's dense, political doc, Condor: The Axis of Evil, was screening, stood Arnold Schwarzenegger, hawking his mega-budget spectacular, Terminator 3. Amid such hype, along with the overwhelming attention given to narrative films and the nightly star turns on the red carpet, the 56th Cannes Film Festival would seem to be the last place serious documentary makers would want to showcase their work. But a number of brand-name, high-profile directors did premiere their films out of the official competition. Among them were Errol Morris with The Fog of War, Ross McElwee with Bright Leaves and Wim Wenders with The Soul of a Man, part of Vulcan Productions' seven-part series, The Blues. None of these films electrified the festival as Michael Moore's Bowling for Columbine did last year. Nor did any win a prize, as none of the documentaries in the various festival selections was eligible for official kudos. However, as international theater audiences have become increasingly enamored with documentaries, so have Cannes' programmers, providing docs with a worldwide launching pad and the festival's attendant cinephiles. "Cannes is a great platform to expose your movie," Wenders, a habitué of the festival and president of Camera d'Or jury this year, told International Documentary at the crowded press conference for his film. "And a few years ago, I don't even think we would have even dreamed to come here with a music documentary; that is relatively new." The only documentary to have ever won the prestigious Palm d'Or (the main competition prize) was Jacques Cousteau's and Louis Malle's Silent World in 1956. Directors Fortnight included Ross McElwee's Bright Leaves, his personal meditation on the tobacco industry in his native North Carolina, and the only US film in that selection. McElwee finished his French-subtitled print just a day before its world premiere. Without a producer's representative or sales agent, and with associate producer Linda Morgenstern fielding calls, McElwee admitted that the festival for him was not a big, highly directed, complex business endeavor. "I want to enjoy myself," said the director. "I'm curious how Europeans will respond [to the film]. I'm just experiencing that. Whatever else comes out of that is fine." McElwee and director Kenneth Bowser of Easy Riders, Raging Bulls (shown at a special screening) both participated in Variety's American Directors panel, moderated by the always articulate Roger Ebert. At least at that event, the doc directors were on equal footing with their fiction feature counterparts. Bowser noted that it was the 1969 film Easy Rider that started the tradition of American films going to Cannes and returning to the States with international validation. He credited cable TV channel TRIO for "selling the hell out of his film." His French sales company TF1 was instrumental in securing festival inclusion. French distributor UGC helped orchestrate James Cameron's Cannes debut as a nonfiction filmmaker. The 3-D HD screening of Ghosts of the Abyss was the largest digital screening ever at the festival, according to Cameron, and it received a splashy, black tie premiere. Cameron noted at the film's press conference that he felt rather awkward for being lauded as a director when in fact, "what I did was direct an expedition; the film just happened." A 60-minute version of the film was shown; the DVD release will be 90 minutes. Since Ghosts of the Abyss, Cameron has made two other docs with an oceanographic theme––one on the Bismarck wreck, the other on creatures that inhabit the deep ocean. His project to film on the international space station is still on the drawing boards. Cinema history is always an important part of the festival, and filmmaker bio-pics were numerous this year. One of the Fellini bio-docs accompanying the Fellini retrospective was IDA member Carmen Piccini's The Magic of Federico Fellini. Richard Schickel's Charlie: The Life and Death of Charlie Chaplin was the warm-up for the closing night film, Chaplin's Modern Times. A trio of politically themed documentaries was very strong. Director Rithy Panh's S21: The Khmer Rouge Killing Machine, financed in part by French TV's Arte, was a chilling and painfully detailed account of the dark days of Cambodia's fratricide. Both Condor: The Axis of Evil and The Fog of War played well in France's tense political climate. 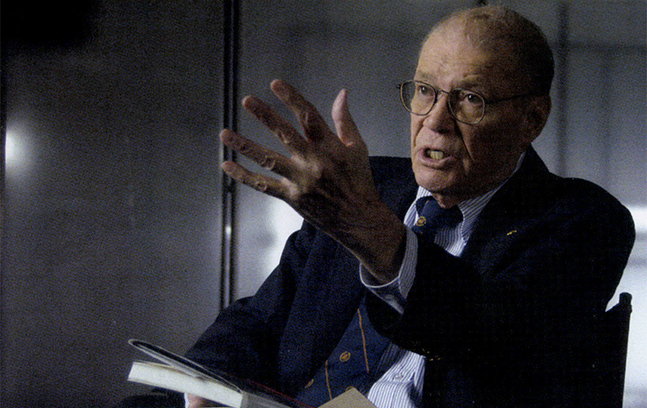 Morris' film revolves around interviews with former defense secretary Robert S. McNamara, the architect of many of today's US military policies. Condor traces the involvement of the US government with military regimes in Chile, Argentina and Paraguay in rooting out dissent by any means, throughout the 1970s and '80s. A significant upside for doc filmmakers making the expensive trek to France was the presence of an estimated 4,000 members of the world's press. Doc press screenings were well attended, with both The Fog of War and the Wenders' film must-sees. As producer's consultant Jonathan Dana noted, "Cannes has very gradually improved, which adds cachet for theatrical and television sales. The success of Bowling for Columbine was not lost on programmers." Nor was its success lost on distributors, who enthusiastically responded to Andrew Jarecki's Capturing the Friedmans at market screenings, buying up rights in many territories. Oversized banners advertised Stacy Peralta's surf doc, Rage in Waves, which received a big promotional push by international sales company Studio Canal. Wenders was positive about the future of docs at the festival and in the marketplace. "Since there is an audience coming to documentaries again, they [distributors] are looking at these films again," he noted. "And the fact that there is an audience coming is sort of a reverse movement. You cannot reduce cinema to just special effects movies. A lot of people have a hunger for reality, and I think documentaries can do that better than anyone else." Kathy A. McDonald is a Los Angeles-based freelance writer who contributes regularly to Variety and Daily Variety's editorial special reports.